Marilyn SanClemente April 5, 2019 April 5, 2019 All Occasion Card, Occasions catalog, Stampin' Up! Today I am sharing a beautiful Handmade Needlepoint Nook card that one of my downline Ruth made using the Stampin’ Up! stamp set Needle & Thread from the Spring Occasions catalog. 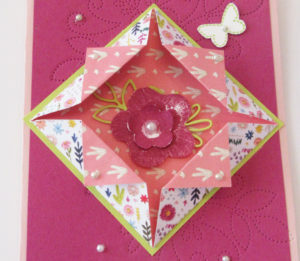 I love the fun fold that Ruth used on this gorgeous card! I absolutely Love the beautiful bright colors used to design this card! The main colors used in this card are Berry Burst, Blushing Bride and Lemon Lime Twist. One of my favorite things about designing with Stampin’ Up! products is the coordination of colors with cardstock, inks and designer papers. All of the designer papers coordinate with Stampin’ Up!’s exclusive ink colors. 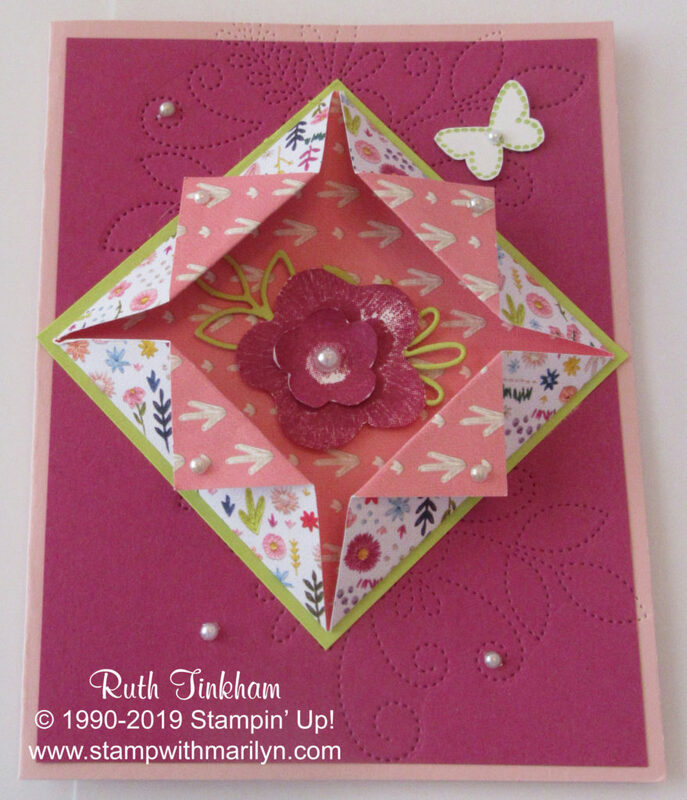 For this card, Ruth designed the base of the card around the detailed flower print pattern that is part of the Needlepoint Nook Designer paper pack. Here are the details of how Ruth made this card. The card base is a piece of Blushing Bride cardstock cut to 5 1/2″ x 8 1/2″ and scored at 4 1/4. 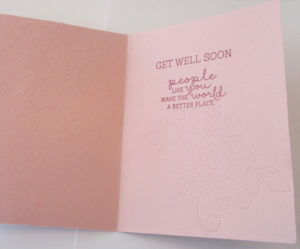 Next she cut a 4″ x 5 1/4″ piece of Berry Burst cardstock and attached this to the front of the card base. Then she used the large die with the filigree pattern from the Needlepoint Elements framelits which creates a stitched effect rather than cutting a design. So place this die on the card front and run through your Big Shot machine. She did this twice to cover the front of the card. This technique will also emboss the inside of the card too which adds a pretty texture to the card! 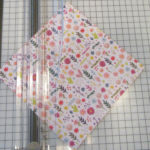 Next she cut a 4″ x 4″ piece of the Needlepoint Nook DSP with the small flower pattern. Mark the center of each side of the square at 2″. Line up the DSP on your cutter with the center of each side lining up on the diagonal to score the fold. Score at 1″ on each side. Fold each side to the center of the square. Then fold the point of the fold back. 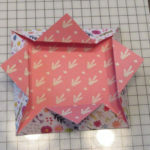 Attach the folded piece to a 4 1/4″ square piece of Lemon Lime Twist Cardstock and attach to the card base on the diagonal. Stamp the two needlepoint flowers with Berry Burst ink on Whisper White cardstock. Stamp the small butterfly with Lemon Lime twist ink on a piece of whisper white cardstock. Cut these items out with the coordinating Needlepoint Elements framelits. Also cut out the leaf outline from a scrap of Lemon Lime twist cardstock. Attach the leaf to the center of the folded square. Pinch the flowers to soften up the cardstock on the flowers and roll the sides of the flower up to the center to give them some dimension. Attach the flowers to the center of the square. Add a few small Pearl Jewels on the swirls of the filigree pattern and to the center of the flowers. Add the small butterfly on the top right of the card. Stamp your message on the inside of the card and enjoy! Fun fold Card, Needle & Thread Stamp set. Bookmark.